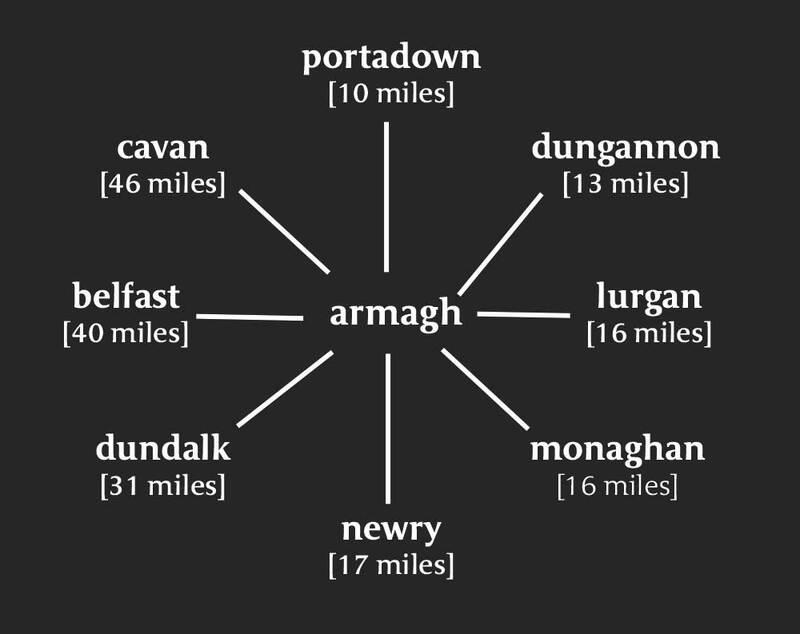 Armagh is on a direct bus link from many areas north and south of the border. Smartcards and mobile tickets are available to help you travel around Northern Ireland by bus and rail. Download the free mLink App from Google Play or App Store to buy your mobile tickets. Translink offers a range of concession and Senior Citizen passes available for travel across Northern Ireland. Child fares and family tickets that cover travel on Ulsterbus, Metro and NI Railways services are also available. Visitors can avail of a Family and Friends Ticket which offers a day’s unlimited travel on bus and rail services in Northern Ireland for two adults and up to four children, There are also services with appeal to visitors such as the Rambler Bus Services which are designed to make scenic rural areas more accessible to sightseers, walkers and cyclists. There are also a huge selection of private coach tour operators, offering airport transfers and scheduled tours to Armagh. Coach tours afford you the chance to let someone else worry about getting here, allowing you to sit back, relax and enjoy the holiday experience. Armagh has a very accessible road transport network and there are ample parking spaces in and around the City centre. Details are provided below of the directions, travel time and distances between Armagh and other key locations in Ireland. From cars to motorcycles to camper vans, vehicle rental is easy and varied. Car companies are generally based in airports and cities. You will need a valid license and credit card to book a vehicle in Ireland. Most rental companies will not rent to drivers under 25 but there is no upper age limit. However, if you are over 75, you will be asked to meet additional requirements. This information is generally included in the terms and conditions on the company’s website. In Ireland, the majority of cars are standard shift (manual transmission). Automatic cars are available but you should book well in advance of travelling to avoid disappointment. If you are travelling with children in need of a car seat tell the car company well in advance. Motability Ireland specialises in modified and hand controlled cars and Accessible Ireland also offers information on vehicle hire. Both Irish Rail (ROI) and NI Railways (NI) offer an excellent choice of fares and information can be found on their websites. Check up on the family and tourist tickets, too, which will prove more economically friendly if you’re planning on a substantial amount of travel throughout Ireland. If you have a student card, bring it everywhere. It will give you discounts and special student rates on bus and train journeys. Bus Éireann and Irish Rail in the Republic of Ireland both offer student rates with a valid student ID card. Translink in Northern Ireland offers savings on bus and rail if you purchase a Translink Student Discount Card, however, you must be on a full-time course or in full-time training in the UK to be eligible. Regular scheduled ferry services operate between Northern Ireland and Great Britain, bringing foot and vehicles into the district via Belfast and Larne. Ferry services also operate into Dublin’s two ports; Dublin Port and Dun Laoghaire www.ireland.com/ferries . Take the M1 South bound. At the end of this road you will see The Mall on your left. You have arrived in Armagh!